We needed a Fun Friday snack. It was only Wednesday, but we needed it. We’re having an awfully rough semester. Since August 26, we’ve been hit with “flu-like” viruses, pneumonia, sinus infections and bronchitis. We’ve had ambulance rides, hospital visits, doctor visits and prescriptions galore. My husband had two weeks of jury duty. I think I visited my local CVS at least 25 times in October alone, and I’m not really even exaggerating. We get a $5 reward every time we fill ten prescriptions there. We have three people (the maximum allowed) registered for the reward program and I think I’ve earned $15. Throughout all of it, I’ve been fighting something upper respiratory, myself and I can’t really say I’m coming out the winner in this fight, either. It’s been a long couple of months, with trying to still stay on top of work, school, birthdays, holidays, food drives and all the other daily “stuff,” but we’re surviving. We’re getting through it and trying to keep all our chins facing in the upward direction. We’ve had plenty of bright spots mixed in throughout the rough spots and we try to make those our focus. We have wonderful friends and family who check in daily, weekly, and more. We know of people who are worse off than we are. Things could be much worse. Even still, some days we need a little bit of help. 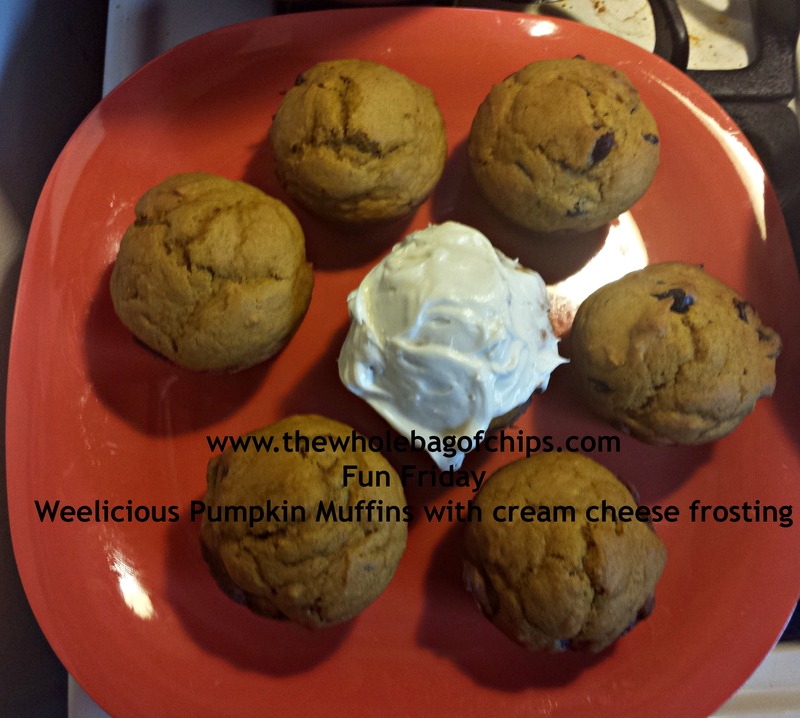 Enter the delicious pumpkin muffins with cream cheese frosting from Weelicious. I have been getting the Weelicious emails in my inbox for a couple of years now. My wee little ones are not so wee or so little any longer, but I find that her recipes are great for all ages. Because we needed even more help seeing the bright spots on this particular day that I tried these, I made them into Pumpkin Chocolate Chip Muffins with cream cheese frosting, because chocolate chips make everything seem better. It leads though, to our previous conversation: are they a muffin or a cupcake? I put in chocolate chips, so that might mean cupcake. If they were just pumpkin, that could mean muffin for sure. But with chocolate chips AND frosting for those who chose to use it, it might be a cupcake. Honestly, with the week we have been having, I didn’t care. They were our after-school snack, late night snack, breakfast and lunch. Whatever they were, they were delicious. Weelicious did not disappoint. She never does. Here is her recipe, so that when you’re in need of a pick-me-up you can give them a try. We loved them! If you love them too, you might want to sign up for the Weelicious emails as well. 2. Place the first 5 ingredients in a bowl and whisk to combine. 5. Pour into greased muffins cups 3/4 full. 8 . Cool, frost and serve.